Now that Bill and I are back from vacation, I have to keep promises I made while we were traveling. One of my goals was to visit Collectors Firearms in Houston, TX. We went there on April 15 (BAG Day). We've visited Collectors Firearms before, but neither of us ever bought a gun there and we were determined that this would change. 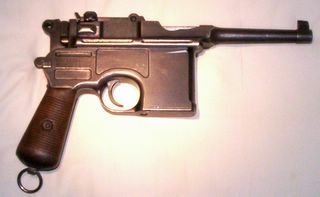 Before leaving home, I searched their website and found a gun I've always wanted to own, a Broomhandle Mauser. And, now I do own one, in fact it is pictured here. The Broomhandle is known by several different names: Broomhandle because of its round grips, C96 (C= Construktion in German), M96, and "Mauser Military Pistol." Paul Mauser didn't invent his namesake pistol in 1896. Its inventors were three brothers Fidel, Friederich, and Josef Feederle all of whom worked for Mauser. Oh, and "Feederle pistol" is one more name for Broomhandles. The so-called Broomhandle is a neat weapon. It is antique and futuristic all at once. It has appeared in many different movies: Lawrence of Arabia, Indiana Jones and the Last Crusade, and all three Star Wars movies featuring Han Solo. Solo's blaster was a heavily modified Broomhandle. It made a brief appearance in Fifth Element and appropriately in Young Winston, a movie about Winston Churchill who owned a Broomhandle Mauser. 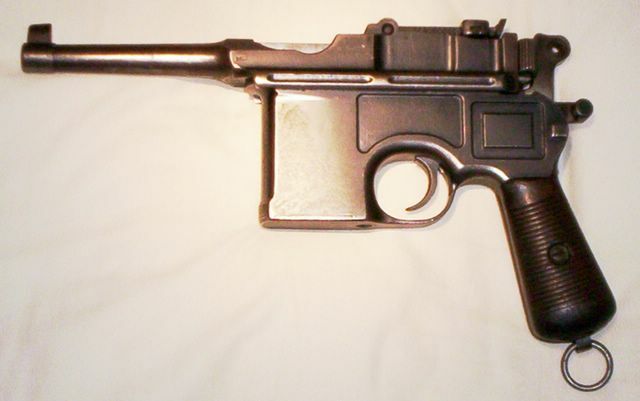 Despite appearing in many war picture, Broomhandle Mausers never caught on as military pistols. They are heavy and ungainly. A few countries bought limited numbers of Broomhandles and soldiers, such as Churchill, sometimes bought them as their personal weapon. Interestingly, Churchill may have been the first military user when he killed three attackers in the Battle of Omdurman in the Sudan in 1898 (at least according to him). Its military features and purposes explain certain design quirks. The safety level sticks out (see top picture, the safety lever is visible just below and at a right angle to the hammer) and seems to be awkward. However, its makers designed it that way so that a cavalry soldier wearing gloves could operate it. It came with a shoulder stock that locked into a groove in the back of its grip thus making a carbine. The wooden stock also served as a holster. It is fed from above by stripper clips that held ten rounds of 7.63 x 25mm ammunition (.30 Mauser). Mauser produced a machine pistol, magazine-fed version called a Schnellfeuerpistole. If 7.63 x 25mm rings a bell its because, its ammunition is very similar to that used in CZ-52s and other Eastern Bloc weapons. Russian revolutionaries in 1917 loved Broomhandles. They loved them so much they kept its ammunition, although a little modified, even when C96s were deemed obsolete. I wouldn't shoot modern 7.62 x 25mm Tokarev cartridges out of my gun because it is a hot load. The Chinese also liked the gun and made a fully automatic version in .45 caliber. My gun is a "Bolo" model. Bolos have a shorter barrel and smaller grips than original Broomhandles. After World War I, the Versailles Treaty micro-managed German armaments and Mauser had to shorten barrels to satisfy a nameless bureaucrat. So far as I can tell, my Broomhandle was built in the early 1920s. Broomhandles are reliable, well-made weapons. I've been looking for one for a long time, and I've seen them with barrels worn smooth, but with sound mechanisms. The strong mechanism is notable. It's actually made with only one screw and that holds the grip panels on. It comes apart and goes back together again like a jigsaw puzzle. I haven't shot my Bolo yet. My gun has all matching serial numbers, about 75% of its blue, a bright bore with little wear, and it is all original--everything a collector like myself loves. Shooting it is a risk since I could break a numbered part and see a serious reduction in value. Still, I'll get a gunsmith to take a quick look at it and I'll use light loads. I shoot all of my firearms because that's what guns are made to do. Besides, I've heard Broomhandles are accurate. Its rear sight is calibrated to 1000 yards. Somehow, I don't think I'll try it at that distance. So, that's my newest firearm and a little of its fascinating history. Hope you like my BAG Day purchase. 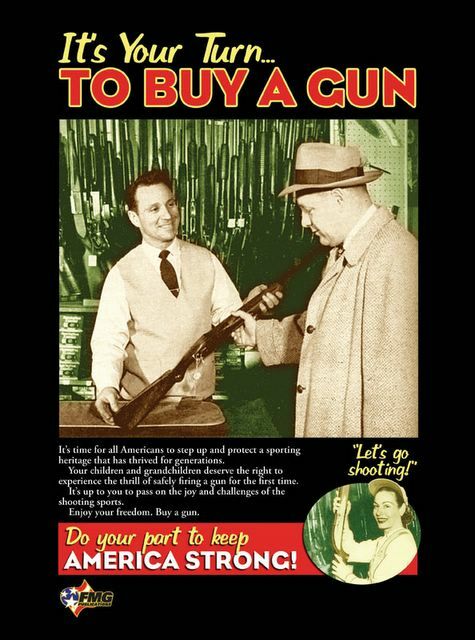 Can We Move Gun Rights Forward? Democrats Getting Rid of Gun Control?